The US memory maker Corsair has presented a new high-end memory line called DDR4 Dominator Platinum ROG Edition. As you can see the new memory line has been developed in partnership with the Republic of Gamers division of ASUS and targets hardware enthusiasts and gamers. In addition to this the DDR4 Dominator Platinum ROG Edition comes with optimizations for the Intel Z170 chipset. The DDR4 Dominator Platinum ROG Edition memory is available as a kit of four memory modules with a capacity of 4 GB for a total of 16 GB. The memory runs at 3200 MHz at 1.35V and features latencies of 16-18-18-36 clocks. The new Corsair memory also comes with a special function that can be only activated in an ASUS ROG motherboard that features the Intel Z170 chipset. The function, called ROG XMP 2.0 is a combination between ROG technology and Intel’s XMP 2.0 memory profiles. When enabled it allows the DDR4 Dominator Platinum ROG Edition memory to run at 3333 MHz at the same latencies. Moreover the new memory features black-and-red aluminum heat sinks and red LEDs that make it look especially good. 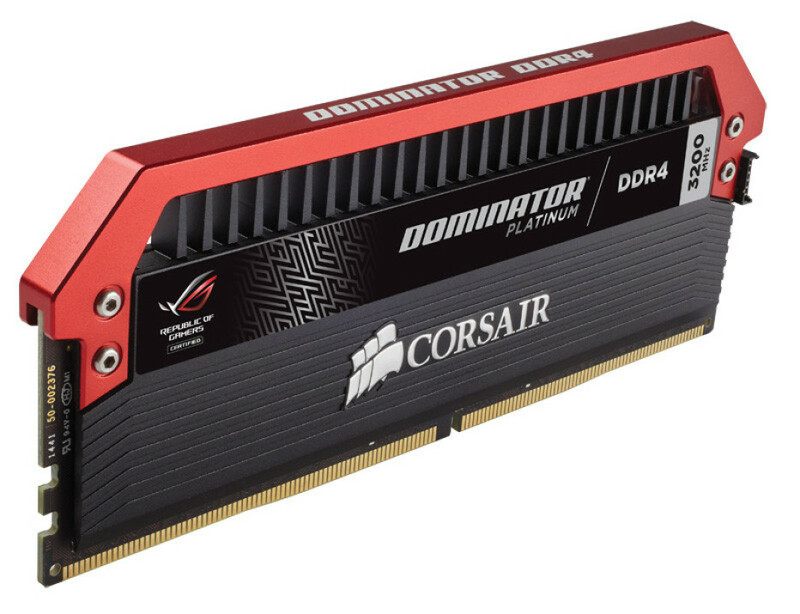 The expected price for a 16 GB kit of the new Corsair DDR4 Dominator Platinum ROG Edition memory is around USD 190. The memory will be in stores shortly.